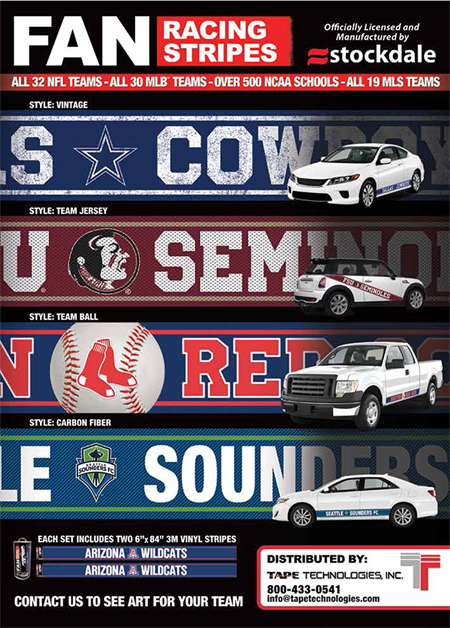 Tape Technologies, Inc. is proud to offer a comprehensive line of officially licensed graphics kits for the automotive aftermarket. We have kits for all 32 NFL teams, all 30 MLB teams, all 19 MLS teams and all of your favorite collegiate teams. These professional grade kits are 6" tall by 84" long to accommodate most vehicles on the road and are produced with 3M Digital Media and overlaminate. Each team has three different design options to satisfy even the most hard-core fans. Since we are selling to professionals in the automotive aftermarket, we have special multi-kit installer pricing as well as warehouse distributor programs for stocking distributors. Call us today for complete details and a Product Guide.